The weather held up really well, with just a little rain falling on us south of Rapid City as we drove from Badlands National Park to lunch in Keystone. 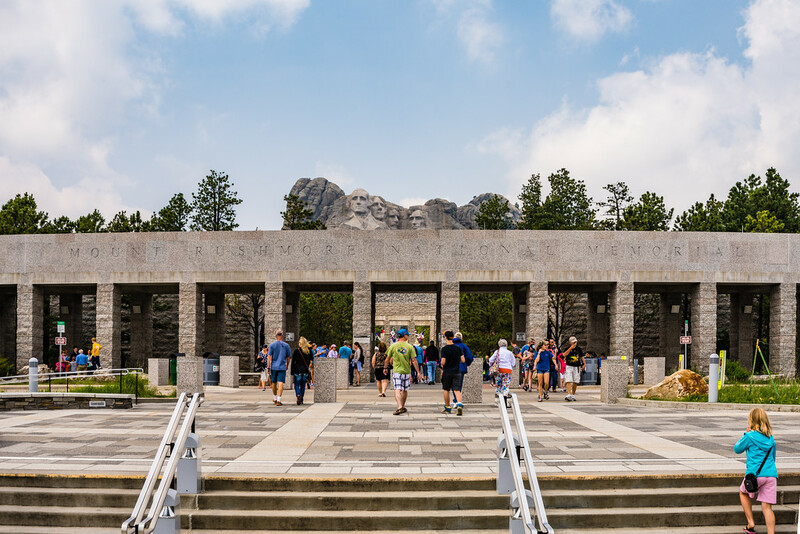 We visited Mount Rushmore and got down to Wind Cave National Park just in time to catch the Natural Entrance Tour. Then we drove north into magnificent Custer State Park—WOW!—and finally made our way to our motel in Rapid City via the spectacular Iron Mountain Road. 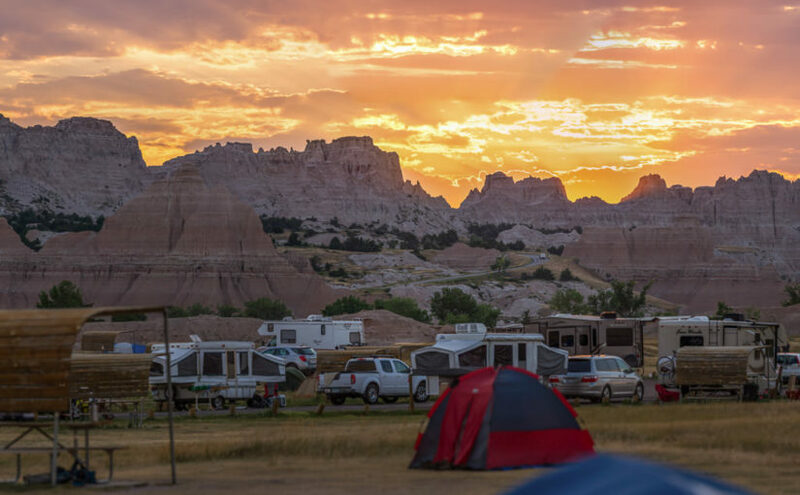 After a positively uneventful and peaceful night in Cedar Pass Campground at Badlands National Park, Becky and I woke up refreshed, and packed up our tent bound for the Black Hills. Becky cooked eggs in a tiny little portable stove she bought that resembles more of what a caterer uses to keep food warm than an actual stove. This was what we had to use to cook at Badlands, since there were no campfires allowed due to the risk of prairie fires. It took a while to cook a single egg, but it was effective. 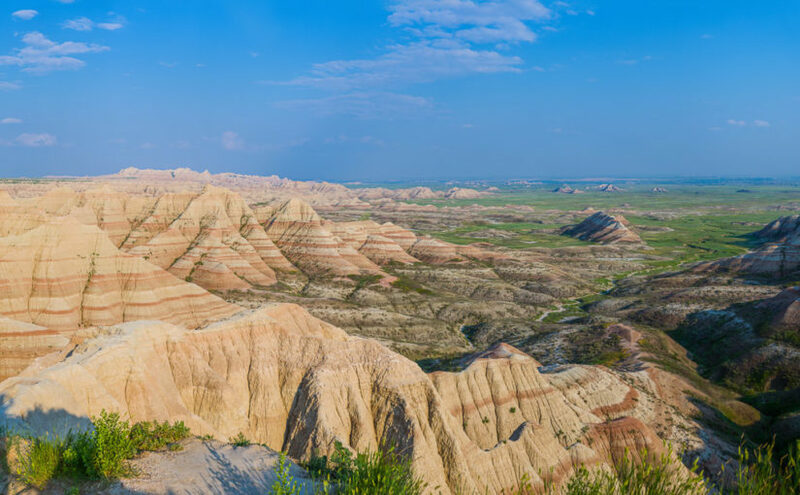 After seeing I-90 and the Badlands Loop Road, I thought it would be best to drive to Rapid City via SD-44 so we could see the other side of the Badlands. Few likely see this area, since it is a much less popular part of the park. 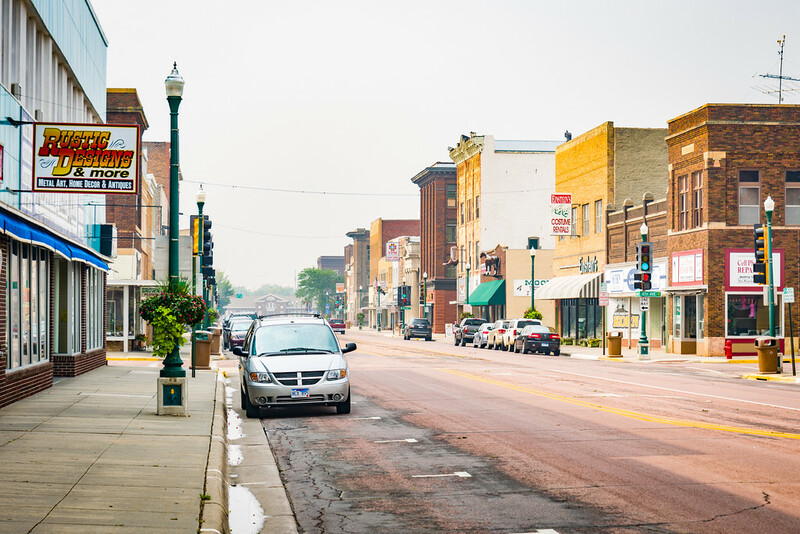 This was a great drive, which starts by going through the tiny little town of Interior, then passing through the town of Scenic, and finally to South Dakota’s second-largest city, Rapid City. SD-44 straggles the border between Badlands National Park and Buffalo Gap National Grassland as it stretches West toward Scenic and Rapid City. Black-footed ferrets, once extinct in South Dakota, prey almost exclusively on prairie dogs for food. They were reintroduced to the wild here in the 1990s, and as a result prairie dogs are protected in Buffalo Gap National Grassland. 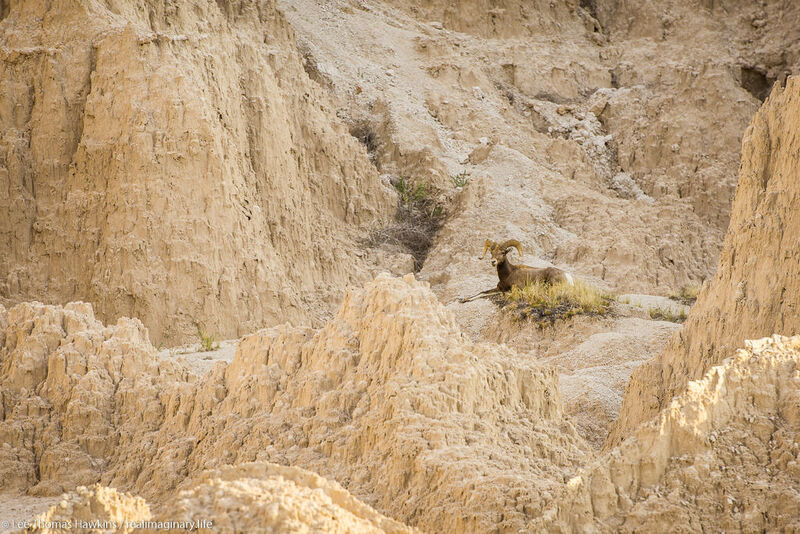 Most of the way was either within Badlands National Park or Buffalo Gap National Grassland. The road runs alongside an abandoned railroad line where small wooden trestles still cross creeks, just without the rails. There were also plenty of pulloffs where you could drive into the grassland on dirt roads. 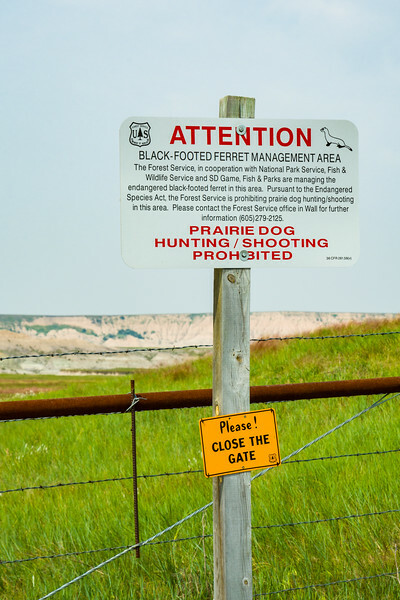 Signs said that this was a management area for the black-footed ferret, which was thought extinct in the late 1970s. A few years later they were spotted again in Wyoming, and eventually reintroduced in areas such as this one. For the majority of the route we could see badlands going on for miles and miles and miles. The railroad line crossing all of the creeks just a few feet above was odd to me. The fact that the creeks had grass all the way down to the water along their entire banks was strange to me too. Back East, the railroads are built far above floodplains, and there are trees and underbrush all around creeks and rivers, and pretty much just mud on the dropoff into the creek. The rolling hills and twisting and turning railroad bed conjured up all sorts of westerns and cartoons I’d seen all my life with scenery like this. When we entered into Black Hills country, it especially felt like I was living in an old western movie, except that technology and the 20th Century had happened and it was a little different now. It was strikingly beautiful country, and a lot of the things I’d seen in stuff set in the Old West started to make sense. I could imagine riding a galloping horse through this valley and on up into Rapid City with the rolling prairie on either side of me, and with the first pines appearing in the Black Hills. Now today had me a bit nervous…up to this point, we had all of our accommodations planned and/or reserved well before we left, except for the motel in Wisconsin. I had also managed to score three nights worth of campsites in Yellowstone online the day we left, and after that nothing was reservable anyway. The one and only night I hadn’t planned out was tonight…I figured on getting a campground as close as possible to Mount Rushmore. I thought it would be good to be able to capture it at sunrise in case sunset didn’t work out, plus it would eliminate any extra driving at the end of the night and hopefully we’d be able to relax. Unfortunately, there were zillions of campgrounds in the area and I had no opportunity to research many of them. The ones I did check were all super-expensive, as in might-as-well-get-a-motel expensive. When we got cell service back again and I could check the forecast, the potential rain and the possibility of having another repeat of DeSmet weather settled it! I Googled around and found a motel—the M Star Rapid City. It was the cheapest thing I could get, and it was close to I-90, so I jumped on it. That was settled! Now it was time to decide which destination to hit first…there were two on our itinerary. 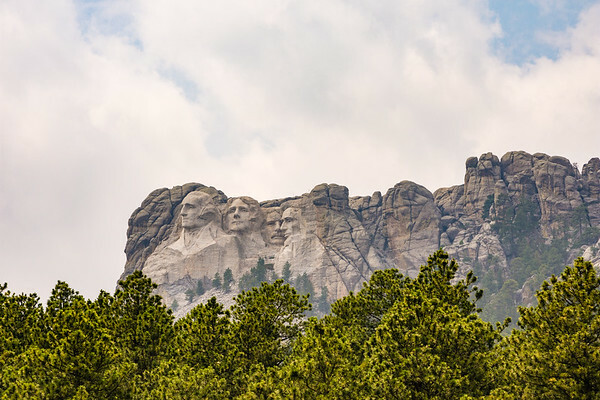 I’d originally planned on going to Wind Cave National Park first thing, then heading to Mount Rushmore by way of the Iron Mountain Road and seeing Rushmore closer to sunset. 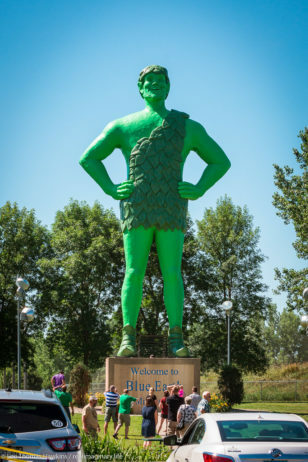 This would give me the opportunity to photograph the sculpture both in the Golden Hour and after dark when it’s all lit up. It was still partly to mostly cloudy, but the forecast called for overcast and possibly rain in the evening. 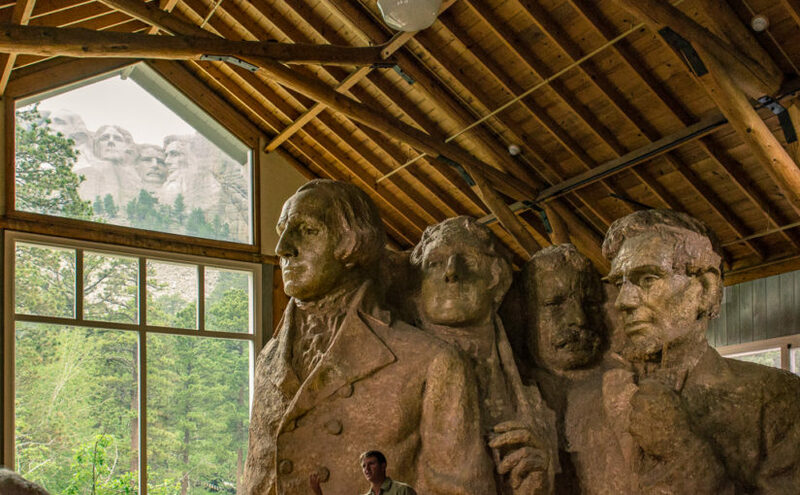 This significantly reduced the probability of getting any interesting shadows or blue sky—and it shouldn’t matter what the weather outside is to tour inside a cave—so we elected to hit Rushmore first after we grabbed lunch. We got a bit of rain between Rapid City and Keystone. 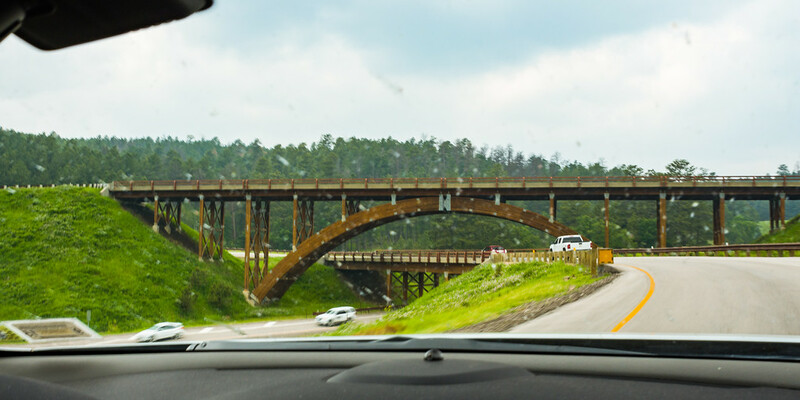 I’d never seen a freeway interchange with wood-framed overpasses like this one at the junction of US-16 and US-16A! 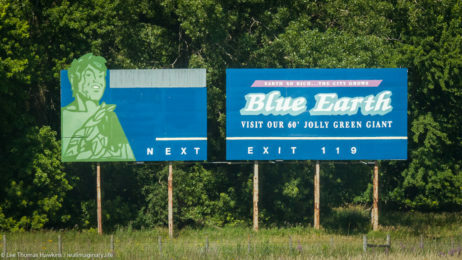 The drive out of Rapid City and deep into the Black Hills was peppered with many and varied tourist traps. Several were totally designed to grab an eight-year-old’s attention so that they would pressure their parents to visit. I still have to admit, a few were tempting to check out. Right before Mount Rushmore, you go through the town of Keystone, which seemed to have more hotels than residents. Again, there were many and varied tourist attractions, several of which were themed around the presidents and their history. We stopped at the Grizzly Creek Restaurant to try their burgers. I went for the bourbon burger and Becky had the buffalo burger. They were tasty and hearty, but not remarkable for the price. They have ten beers on tap, two or three of which were the standard Miller and Budweiser choices, while the rest were all local microbrews. We still had a lot ahead of us for the day, so I decided not to have anything after I tasted a sample of the only beer that really sounded good to me—which was a wheat beer that tasted too hoppy for my liking. The clouds were just beginning to subside as we caught our first sight of Mount Rushmore from SD-244. Mount Rushmore was a busy place, probably the busiest we’d seen so far on this trip. It was nowhere near congested though, especially compared with just about any of the major tourist attractions in California. As you drive up on SD-244 to the monument, you actually catch your first site of it, which is pretty striking. At the entrance are ticket gates where you have to pay to park in the massive deck they built back in the 1990s. Unfortunately, the Annual Pass we just bought at Badlands doesn’t apply here, as a separate organization operates the parking deck. Finding parking was not too difficult, and neither was making our way up to the monument. Mount Rushmore towers over the grand entrance to the memorial from the parking decks. 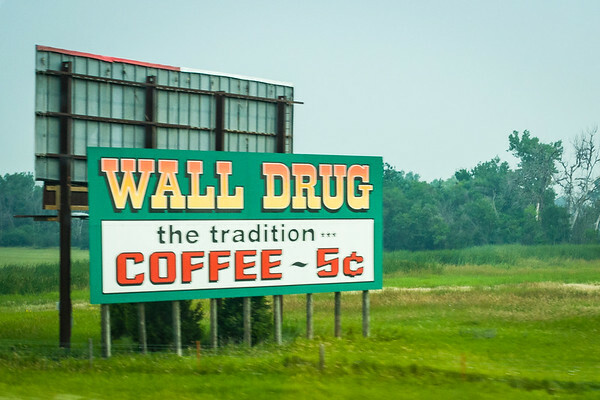 We drove through drizzly conditions from De Smet to Mitchell in Eastern South Dakota, and then traversed most of the state on I-90 to Badlands National Park and Wall. So, after another violent Great Plains storm (albeit in much more secure conditions) and our car already packed, we emerged from our covered wagon to much cooler but drizzly weather. The misty haze was not looking good for my photographic aspirations today! The forecast showed the rain holding on for just a little longer in De Smet, and that there would be a general clearing trend where the sun might come out and burn off the fog. Becky and I each got showers this morning, since it would have more long-lasting effects than if we’d showered the night before with the 85-90 degree heat and humidity. The humidity in South Dakota was nowhere near as high as what we had experienced before we left Ohio, but it was enough to make you move a lot slower so you didn’t overexert yourself in the heat. Now that the temperature had dropped to 65-70 degrees, everything except the haze was peachy. We got a fairly early start, getting out of the Ingalls Homestead around 8am. We headed into De Smet and to the local coffee shop, Ward’s Store. Interestingly enough, this was the site of Charles Ingalls’ store, and in the original building that rose in its place after he sold it and moved out to his homestead. Becky was really glad to have gotten coffee here, since now she’s been to every place where Laura lived in De Smet. We then continued south on SD-25, making our way down to Mitchell, which is only about an hour away. We planned to see the famous Corn Palace, and I hoped to score a quick breakfast. Ever since we’d left De Smet, it had been horribly foggy, drizzly, and hazy. The rain had let up completely by the time we’d reached Mitchell, but the fog lingered. We got breakfast at a hip restaurant called Cafe Teresa. The place seemed to be loaded with college students, who I’m assuming were from Dakota Wesleyan University. It was easy to overhear bits of conversations about finals, classes, and professors. Becky and I both ordered eggs and toast, which hit the spot..and so off we went to see the Corn Palace. 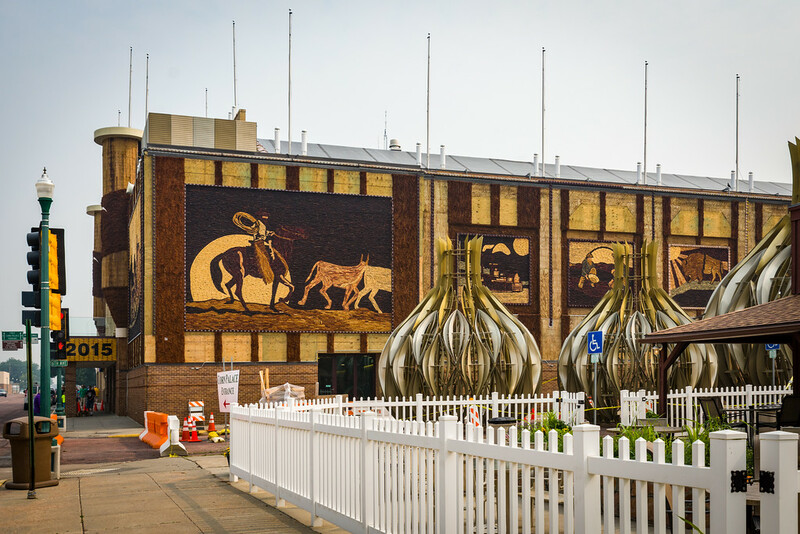 The Corn Palace is the main tourist draw in Mitchell, which has about 15,000 residents and a rather quaint and decidedly Western downtown. 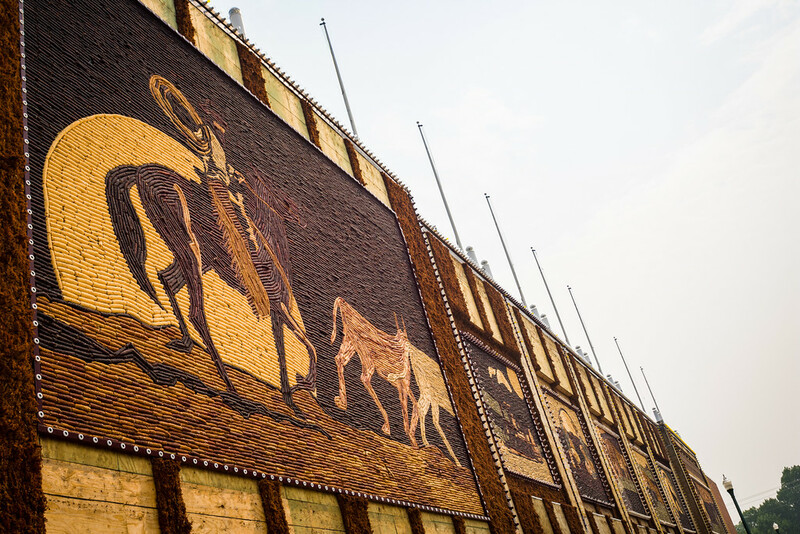 The building is decorated on its exterior by thousands or maybe millions of ears of corn, color coordinated to depict western scenes of cowboys, buffalo, stagecoaches, and Indians on the front and sides of the building. Unfortunately, it took us a bit to make sure we had actually found it because it looked much less flamboyant than the pictures we’d seen. Apparently they were in the process of replacing the domes on top and had run into a delay because the new domes weren’t strong enough to hold up to South Dakota’s wind (which Becky and I have noticed is quite substantial). Also, it appeared that they were updating parts of the building’s exterior, which they do every year anyway because it’s probably a good idea to slap a fresh coat of corn on the building to keep it from peeling. So it’s that kind of palace! 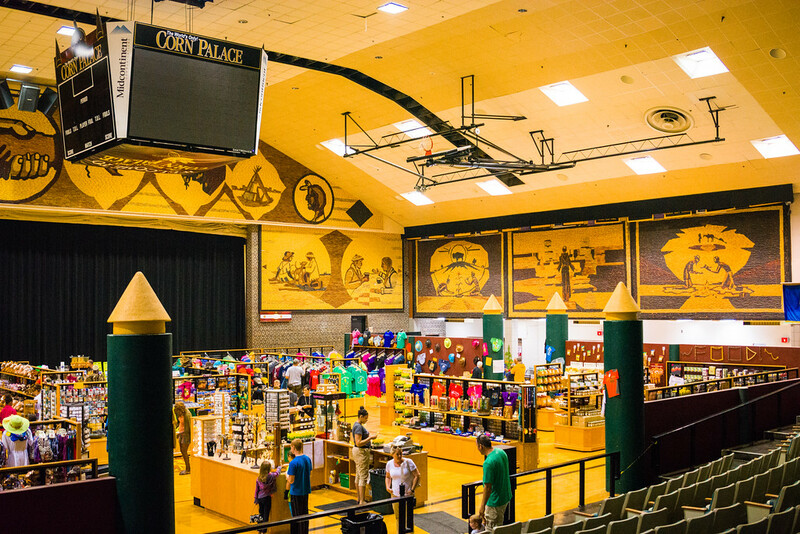 Becky and I proceeded inside “The World’s Only Corn Palace”, hoping for a more satiating indoor experience. There were lots of exhibits inside about corn, the history of the Corn Palace (reaching way back into the 1890s), and then there were doors…turns out through the doors you could see that the Corn Palace had a lot in common with San Francisco’s Cow Palace and the Detroit Area’s Palace of Auburn Hills—for it was a small basketball arena where a giant souvenir and gift shop had been set up. I didn’t figure it for an opera house, but I have to admit that without having done any research that in the back of my mind when I saw the general shape and size of the building, I wondered if in fact this was a basketball arena. It seemed like a very nice place to see a game. It was likely that it hosted games for either the Dakota Wesleyan University or the local high schools. 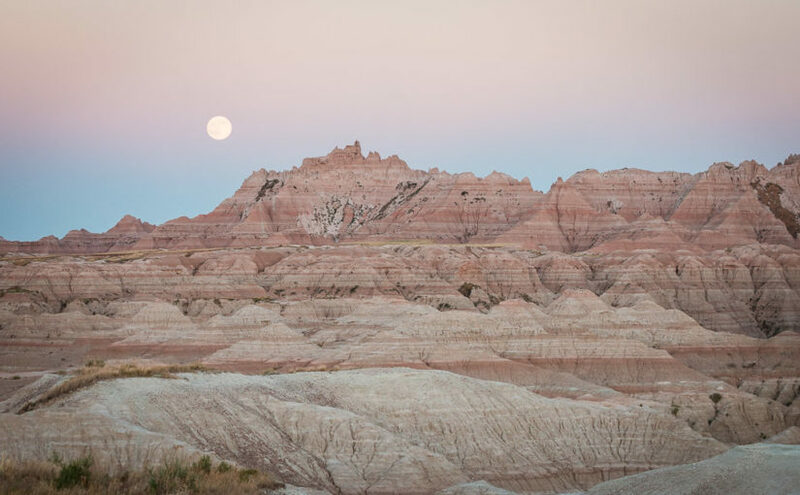 But either way, the clock was ticking and we had to move on to Badlands National Park, which was about 3 hours away on I-90. 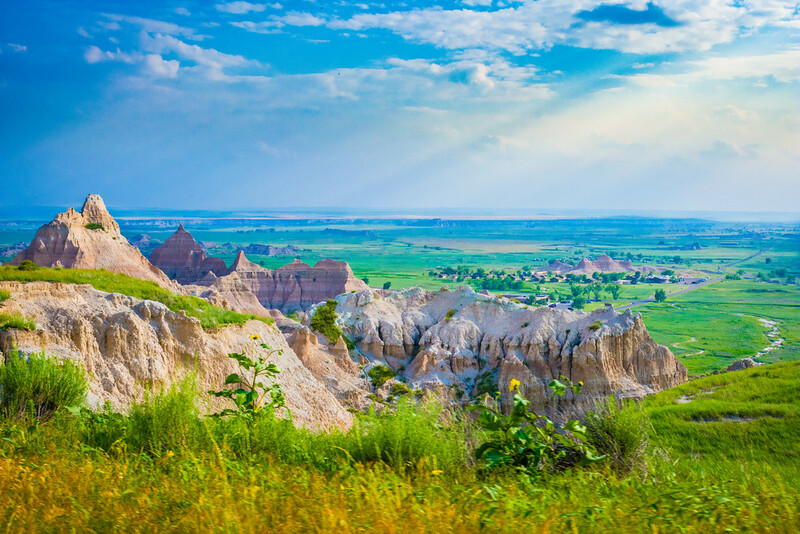 You GOTTA SEE South Dakota! A VERY small sample of the gimmicky advertising…I regret that I did not capture more of these sorts of things! I’d like to take this opportunity to recognize South Dakota for a couple of things. First, Mitchell was my first indication that South Dakota really was a great place to analyze advertising gimmicks, because between what we saw here and what we saw later that day in Wall, it was readily apparent that South Dakota took the art of a tourist trap to a refined art form! 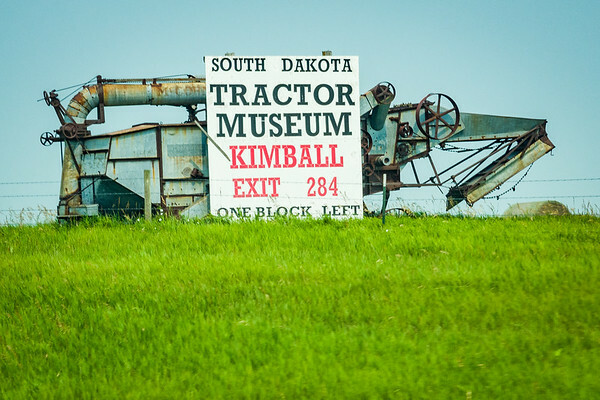 There were signs and buildings and old trucks and cars and dinosaurs in front of billboards all along the interstate that really were sights in their own right and really made it tempting to stop a lot along the freeway and check this stuff out. 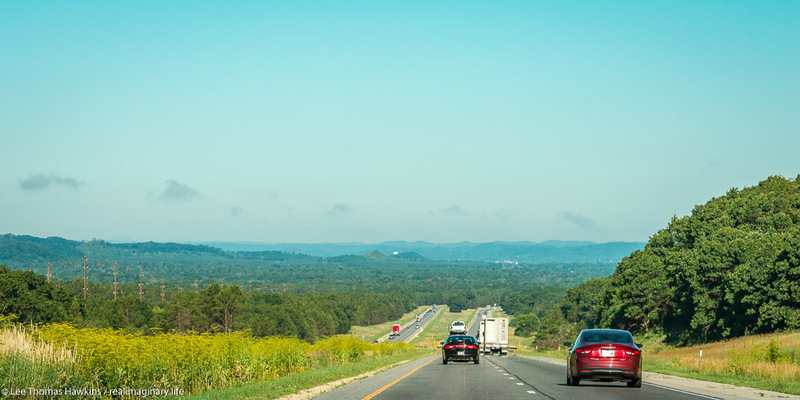 No, your eyes do not deceive—the speed limit really is 80mph! 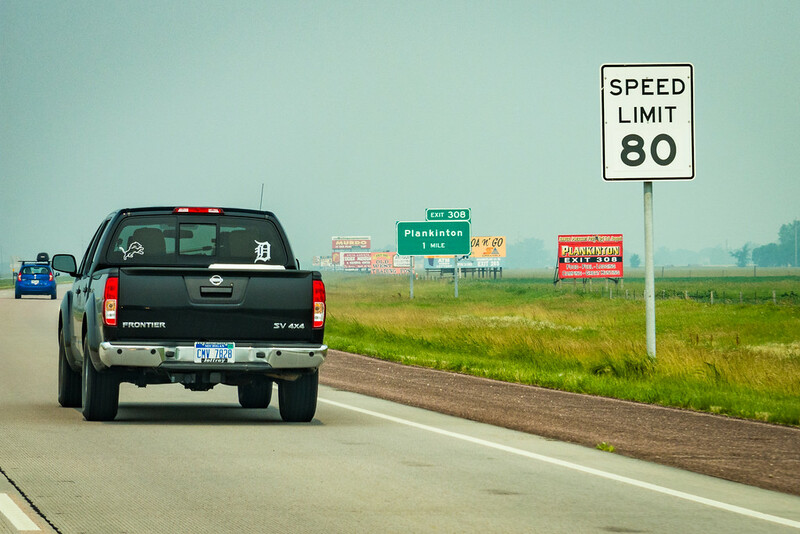 Second, the speed limits in South Dakota often seemed to actually make sense! In Minnesota and most other states, you drove 55mph, maybe 60 if you were lucky in remote two-lane state highways—we hit the SD state line, and voila—65mph! 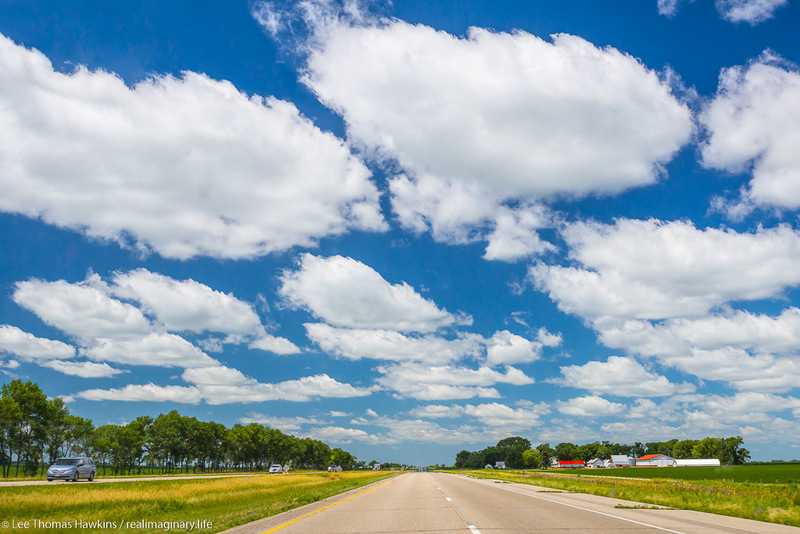 When we first got on I-90 in Mitchell, we had to check our eyes at first—”Speed Limit 80″—AWESOME! So thank you, South Dakota, for admitting that you might as well be able to drive fast on the roads here because there are so very few cars, the visibility is great, and it takes so very long to reach someplace. Another reflection I have to make about South Dakota is that I didn’t expect it to have so many trees—in fact, I didn’t expect it to have any at all without at least a creek nearby, since it is in the Great Plains—and the Great Plains is a great big huge prairie that just doesn’t have the rainfall to really grow trees. Apparently the main reason why there are so many trees is because of the Homestead Act, which allowed you to earn your 160 acres of land through growing enough trees on your claim…and probably because people who aren’t used to vast open grasslands prefer to have lots of trees to break up the scenery (and did we mention wind?). Personally, I’m all about diversity and history, so I was excited at the prospect of seeing a land that was just covered with prairie and all the things that come with it! I also think a giant prairie sounds awesome for just grazing cattle, which we saw a lot of actually. Black Angus cows were everywhere, and lots of pieces of property up in the northern part of the state had lakes and sloughs where the cows often congregated to play in the water and drink as well as graze. As we pushed farther west from Mitchell, we started to see a lot more of the open prairie I expected and we got to see fewer trees if any at all. One big misnomer about the Great Plains is that it is all flat. That may be true in places like Illinois or Kansas, but it is most definitely not the case in Minnesota or South Dakota where rolling hills are pretty much the rule. There are even deep valleys, especially along I-90, with the biggest valley being the Missouri River, which runs right through the state. It was unfortunately extremely foggy when we crossed it, but it was still a site to behold! It seriously was more like crossing an expansive lake than crossing a river, and was actually much much bigger in person! If they had called it part of the Mississippi instead of naming it a whole other river, the Missouri-Mississippi River would be among the longest in the world, and from what we saw, it had enough water to prove it! Crossing the Missouri River on I-90. Sorry for how hard it is to see anything, but it was actually so foggy that we could see even less in person! I cranked the Dehaze on Adobe Lightroom up to +75 for this one (no joke)! Crossing the Missouri was significant for another reason too—prairie dogs—of which we had seen none so far along the entire prairie we had crossed. I asked someone about that in De Smet, and was told that all the prairie dogs were located on the other side of the Missouri River. The locals here hate them, because as this gentleman said, prairie dogs with their burrowing “just destroy the land”. We were still looking forward to seeing some though, as they are an animal unique to the American West. Another feature I noticed were steep escarpments to the south along the freeway, and sometimes there would be giant protruding chunks of land in the middle of the prairie. 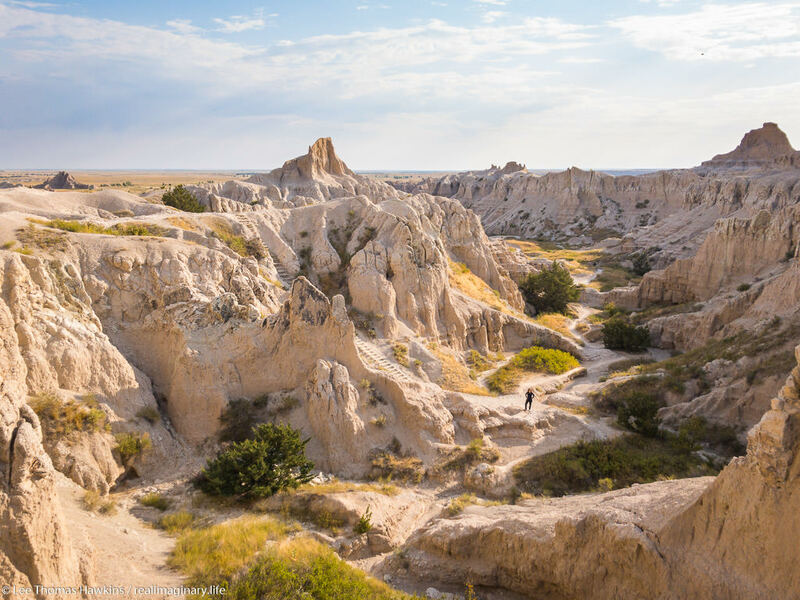 We were pushing closer to the Badlands, and so it seemed there were small little badlands appearing more frequently in the distance to our south along the freeway. When we got on I-90, I told Becky to let me know if she wanted me to drive, since we’re about to get on a long stretch of mostly straight freeway where highway hypnosis can set in. About an hour or so away from Badlands, Becky said she was starting to have trouble, so I had her pull off a few exits down the road so I could finish my last blog entry. It was my first taste of legally zipping along at 80mph, on a freeway in the middle of the open prairie. Who knew crap like this would be in such demand? 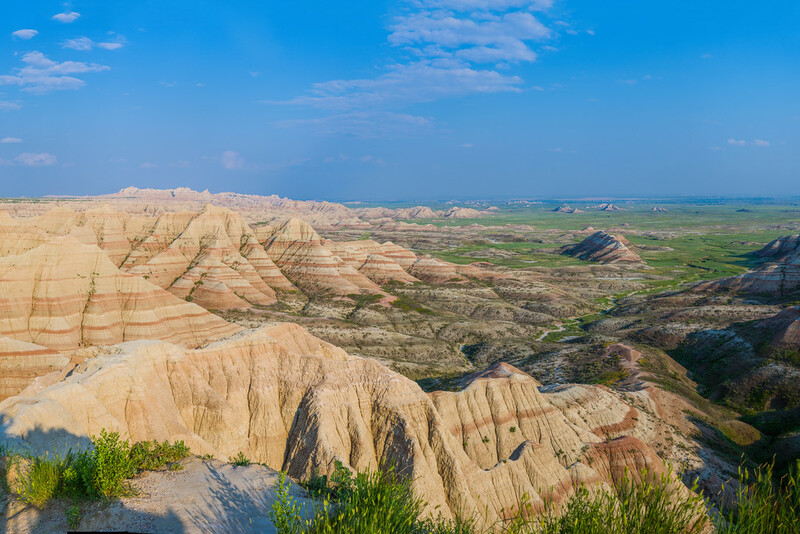 We were just a few miles away from our exit for Badlands National Park on I-90 where we pulled off the freeway at a scenic overlook. 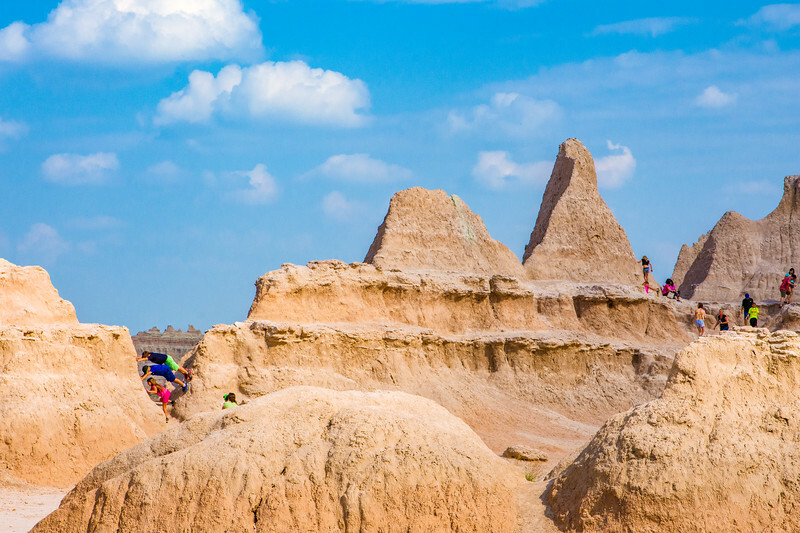 As we headed up the hill to take in the view of the expansive prairie all around us and the Badlands in the distance to the Southwest, two people seemed engrossed in some sort of spectacle taking place on the ground. 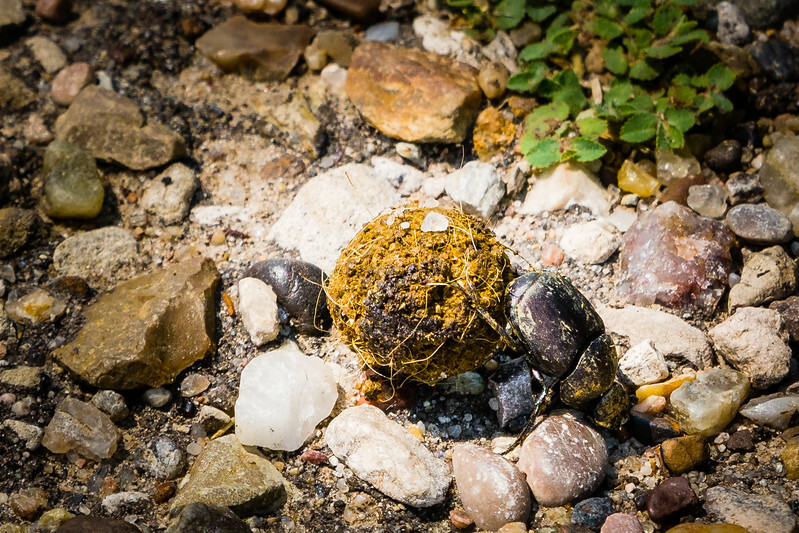 When we got close enough, you could see two little pieces of poop rolling up the hill being pushed by little dung beetles who were happy to have scored dinner! Unlike many national parks, you can go off-trail and climb on the rocks…so your photo-op creativity is really only limited by your command of gravity! 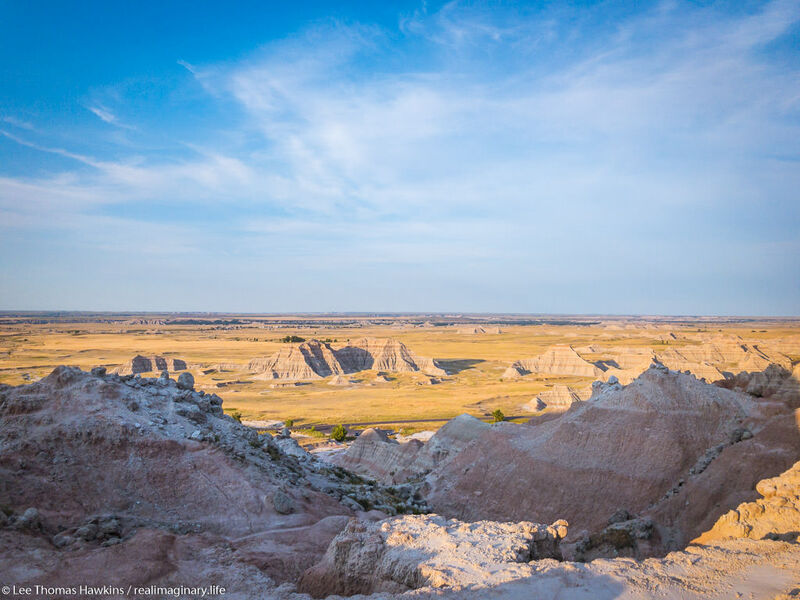 We pressed on into Badlands National Park, a place where neither of us had ever been, and our first national park of the trip. On the map it looked as if you got off the freeway and BOOM there’s the Badlands. Reality however, was that it was still nearly ten miles until we reached the park entrance. Since we planned on visiting four national parks with entrance fees on this trip alone, we ended up purchasing an annual pass for $80. The total for entering each of these with just an individual park pass would be $105, so I recommend the annual pass if you plan a trip like this, at it saves you a substantial amount of money! 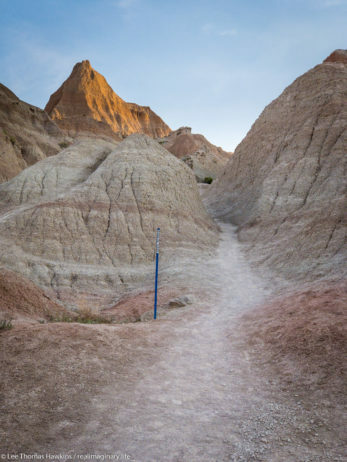 Entering the Badlands was like entering another world! 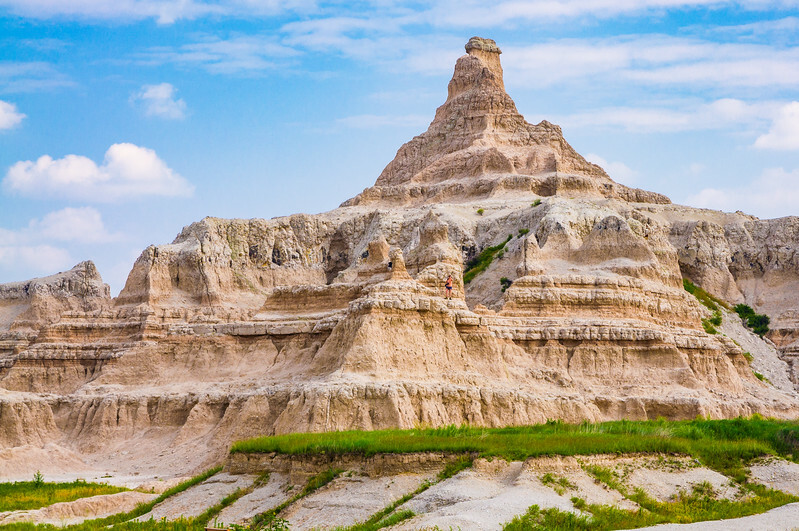 You’re on the prairie and then there are sharp layered outcroppings of rock that look like teeth made of mud sticking straight out of the ground. Some were as tall as a person, and some were hundreds of feet high, while plenty of others were in between. Cedar Pass was positively awesome, where the road descends at least a couple hundred feet down an escarpment that revealed how big these Badlands really were when you could see them from the south. It was almost like going down a great big step over a monster’s bottom teeth and into its mouth.